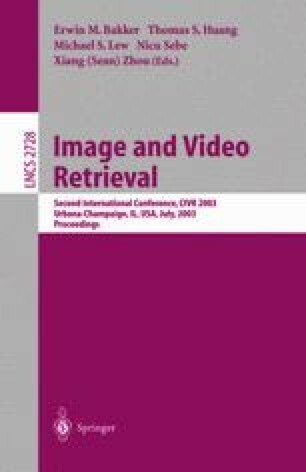 Moving objects’ trajectories play an important role in doing content-based retrieval in video databases. In this paper, we propose a new k-warping distance algorithm which modifies the existing time warping distance algorithm by permitting up to k replications for an arbitrary motion of a query trajectory to measure the similarity between two trajectories. Based on our k-warping distance algorithm, we also propose a new similar sub-trajectory retrieval scheme for efficient retrieval on moving objects’ trajectories in video databases. Our scheme can support multiple properties including direction, distance, and time and can provide the approximate matching that is superior to the exact matching. As its application, we implement the Content-based Soccer Video Retrieval (CSVR) system. Finally, we show from our experiment that our scheme outperforms Li’s scheme (no-warping) and Shan’s scheme (infinite-warping) in terms of precision and recall measures.